More property for your investment dollar, sitting on the cusp of Capital Growth + Stronger Rental Yields ! It was only last week the Australian Financial Review (AFR) reported there were more homes for sale in Melbourne and Sydney than at any other time in the past two years. The AFR is owned by Fairfax Media, as is the real estate website, Domain, whose chief economist Andrew Wilson was quoted as saying, “The market did rebound with lower interest rates last year and the end of last year was quite strong for markets, and perhaps there is also a sense of the market peaking”. Fuelling negative sentiment towards the industry was the fact that auction clearance rates have been showing signs of weakness. The AFR report also noted that analysts are taking a negative stance towards the sector with HSBC recently predicting national property price growth to halve over the next 18 months. Yet it isn’t all doom and gloom. As is often the case in equity markets, pockets of value emerge when investors adopt a broad-brush mentality towards a particular sector. In particular, property investors should keep an eye on quiet Queensland, for reasons we’ll go into further in the article. First, let’s take a deeper look at the current slowdown affecting the overall market. Housing starts data is often a good indicator of the big picture when there is volatility in property, providing an indication of likely demand for new property. The following graph indicates that while the Housing Industry Association (HIA) is predicting a pullback from record levels in 2015-16, in relative terms compared with the last 10 years the industry remains in good shape. The 2016-17 projection of circa 220,000 commencements would be the second best performance in over a decade. Likewise, the 2017-18 projections are only surpassed by the boom years between 2014 and 2016. Even at the bottom end of HIA’s projected retracements, where it predicts housing starts of circa 176,000 in 2018-19, this figure was eclipsed on only three occasions in the 10-year period to 2015-16. HIA senior economist, Shane Garrett, summed up the current outlook. “Even though new dwelling starts will decline over the next couple of years, the annual volume of new home starts is not likely to fall below 170,000 at any stage, and by any standard this is still a very robust level of activity,” he said. He also noted that the housing boom was not consistent across Australia and now with New South Wales and Victoria cooling, all indicators are that the market is well past its 2016 peak. Interestingly, as New South Wales and Victoria markets are coming off, last week’s data regarding new home lending in May indicates that sentiment towards the property sector in Queensland has been unaffected by trends in the two boom states. There was a 28% month on month increase in lending to new home buyers in Queensland, which also represented a quarter on quarter increase of 14.6% ­– the strongest result across Australia. The robust data also flowed through to the number of loans to owner occupiers constructing or purchasing new homes. In the 12 months to May 2017, the strongest growth in loans to owner occupiers constructing or purchasing new homes was in Queensland (+10.8%), well ahead of Victoria (+6%) and New South Wales (+2.5%). 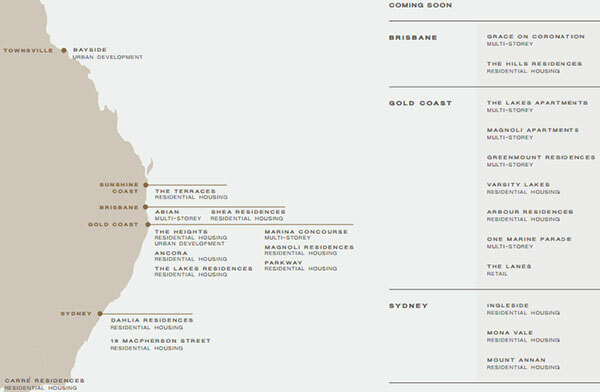 While the following is a snapshot of Sunland Group’s (ASX: SDG) properties under construction and in the pipeline, it is also fairly indicative of industry activity by region in the state. Population growth is having a significant impact on Brisbane, the Gold Coast and the Sunshine Coast. 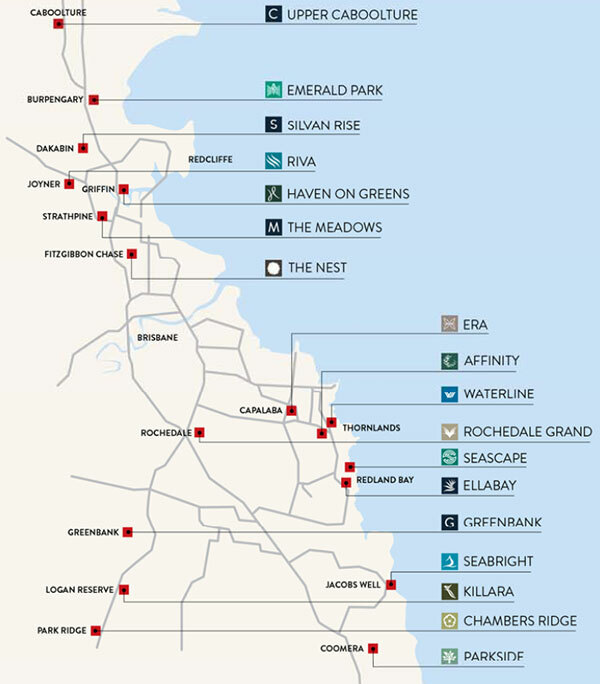 Urban development between both Brisbane and the Gold and Sunshine Coasts, including areas just over the Tweed River border, has been extensive. In tandem with these developments has been the construction of major multilane highways, which now carry commuters who sought a seachange but have found employment in Brisbane. It takes approximately one hour to drive from the heart of the Gold Coast to Brisbane. With road upgrades also happening between Brisbane and the Sunshine Coast, that trip will likely end up a similar timeframe. Bright future for the Sunshine Coast? The Sunshine Coast is only in its infancy compared with the Gold Coast. While thriving tourist hubs such as Noosa and Mooloolaba may indicate that the market is relatively mature, this is far from the case. 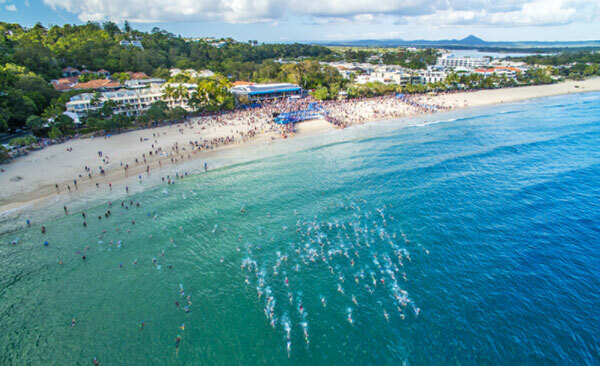 While tourism has put trendy meccas like Noosa on the map, the broader Sunshine Coast property market is being driven by robust population growth and increasing employment opportunities, while still providing access to the lifestyle the region is renowned for. The new Sunshine Coast University Hospital serves a population of about 390,000 which is forecast to increase to 23 per cent to ~480,000 by 2021. The hospital will eventually expand to a 738 bed facility and be one of the state’s top-tier training hospitals. It is estimated that once the hospital is operating at full capacity, 10,000 fewer patients each year will need to travel to Brisbane for complex health care. While this is making the Sunshine Coast a more attractive destination for retirees who are looking for the security of comprehensive healthcare, it is also attracting specialists, medical staff from all fields, nurses, ward staff and maintenance workers – a trend that will drive substantial momentum in residential housing. You can see here how residents settling into this once little-known hub of the Sunshine Coast now have the surf, as well as most necessary services such as health, education and transport infrastructure within a 10 minute walk or short drive from their front door. This cardiac specialist who wants to practice what he preaches will even be able to kayak from his Bokarina Beach home (developed by Stockland) via the canal, under the highway, and across Lake Kawana, for the best part through to the Hospital precinct. However, healthcare is only one driver for the region. The University of the Sunshine Coast is developing a full-service campus that will cater for up to 10,000 students within the first 10 years, starting 2020. Like the hospital, this will also provide a significant boost to the construction industry on the Sunshine Coast. Villa World generates a significant proportion of revenues from the Queensland market. As the below demonstrates, it has a large pipeline of projects stretching from just south of the Sunshine Coast through to the northern fringe of the Gold Coast. 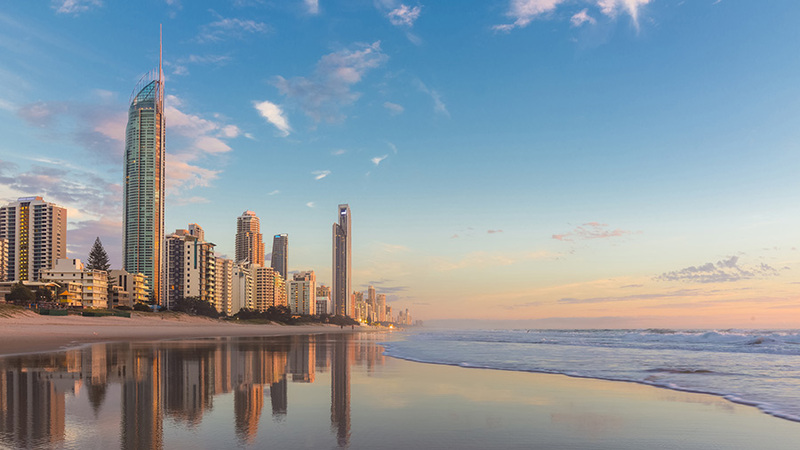 With cooling markets further south, and data suggesting Queensland is nonetheless enjoying smooth-sailing in the realm of market sentiment, we may need to rethink the notion that Australia’s property boom states are only in the south. With a significant boost in recent month on month lending to new home buyers in the sunny state, the future is looking sunny – which, perhaps to Queenslanders, is not as surprising as it is to everyone else.